While hiking Woods Canyon Trail near Sedona, Arizona, you may spot a glistening rock that catches your eye. Amber crystals coated one side—a chip from a large geode. As much as you may adore earthly objects found in nature and want to take them home—don’t. This simple chunk of beauty was Mother Nature’s jeweled accessory she was showing you. “Leave what you find” is one of seven principles in the “Leave No Trace” philosophy, which strives to minimize human impact as we enjoy the great outdoors. Sedona, with 1.8 million acres of national forest land and 300-plus miles of developed trails, is a plein air playground, which earned the city the top spot in the USA Today Weekend list of “The 10 Most Beautiful Places in America.” But if every visitor kept what they found in Sedona’s stunning red rock wilderness, the luster of what many argue is “the most beautiful place on Earth” might soon fade. So, as you hike, climb, swim, fish, peddle, paddle and tour this mecca of outdoor adventure, observe and appreciate but take only photos, videos and memories to cherish. 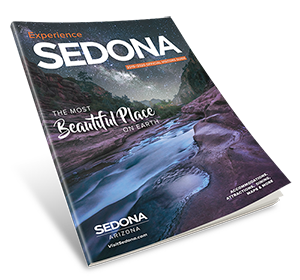 Planning, another important tenet to responsible stewardship of the natural environment, is easy when you order the glossy Experience Sedona Guide and browse its interactive website, VisitSedona.com, packed with information, suggested itineraries and its Secret Seven experiences. These resources are great to learn where to stay, what to do and where to dine while visiting Red Rock Country, but when you venture into its beauty, detailed preparedness is a practice that will ensure the most pleasant and rewarding visit. Get priceless insider tips while collecting helpful brochures and requisite maps at the official Sedona Chamber of Commerce & Tourism Bureau’s Visitor Center and the U.S. Forest Service Red Rock Ranger Station. Understanding unique seasonal trends like weather and climate, peak visitation times and wildlife behavior will promise not only an exceptional experience but also a safe one. Whenever hiking on a well-maintained trail, like Vultee Arch Trail, you may start to wonder about the people who built and maintain it and how much time it took. In Sedona, it’s a community effort. The Sedona Chamber of Commerce &Tourism Bureau, along with 35 local businesses, sponsor the Sedona Trail Keepers program to provide funding and preserve the pristine environment within their beloved trail system. To keep the trails in mint condition, don’t wander off the trail to create offshoots that trample natural habitats or encourage erosion that can lead to trail confusion. Whether treading on foot, tire or hoof, keep on the established path and resist the urge to blaze a new one. From glamping at well-appointed RV parks to getting back to basics at campgrounds in the Coconino National Forest and beyond, camping brings a bounty of quality time for family bonding or simply getting off the grid. Gazing at the shimmering night sky, listening to the chirping of birds and chirring of insects, becoming entranced by the golden flames of a campfire and falling asleep to the lulling babble of Oak Creek are just some of the simple pleasures of spending the night among nature. Camp at established sites or in dispersed locations on rocks, gravel, snow or dried grass away from water sources to allow thirsty wildlife a wide berth. Sedona’s vast wilderness area and flourishing riparian zones provide habitat to many species. Though animals fear and avoid humans, sightings of black bears, foxes, deer, javelinas, mountain lions, bobcats, coyotes, jackrabbits, tarantulas, scorpions, reptiles, road runners, hawks, eagles and a host of other birds are common. If you’re fortunate enough to be visited by a resident member of the animal kingdom, keep your distance, never share your food and ensure your pets are on a leash so they don’t provoke or startle wildlife. Sleeping outside among the critters isn’t for everyone. Instead, minimize your impression in nature by renting a remote and cozy cabin or enjoying the luxuries of romantic bed-and-breakfast inns. Many are nestled amid the tall pines or along Oak Creek so you can still be close to nature without giving up the comforts of a soft bed and the security of a sturdy shelter. If the wilderness is a scary place, or you lack the time to plan and prepare an outdoor adventure, Sedona has outdoor guides and tour operators that can provide you a safe and organized outing. Consider a horseback ride or an ATV or jeep tour through well-worn yet rugged terrain. Perhaps your preferred trail is a waterway? Cool off with these rafting adventures on the Verde River. Book a guided day hike, a bike-and-hike adventure or an inn-based hiking tour. Maybe you’re ready to take it a step further with a guided multiday backpacking trip? With so many options, there’s no reason to deny yourself the numerous health benefits that being in nature provides. Many people assert that being in nature is a profoundly spiritual experience, which makes Sedona a divine utopia. With its sublime sunsets, positive vibes and incredible landscapes like the iconic Yavapai Vista or the incredible landscapes of Aerie Trail, it’s easy to feel inspired by forces greater than yourself. To enhance your spiritual experience, find your spirit guide in a Native American ceremony, feel the Earth’s energy on a vortex tour, or stand tall in tree pose during a small group or private yoga session in a meadow along the calming waters of Oak Creek. Yet, all that’s really required to summon your spiritual side is a peaceful place where you can commune with nature. So, just as you respect the wildlife, be considerate of those around you by turning down your music, allowing people their space and watching your pets. Minimize campfire impacts and be careful with fire.